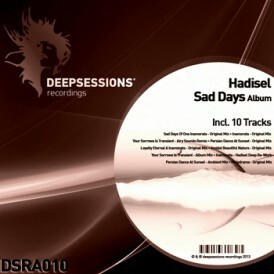 Hadisel has only been producing for about a year and has a wide range of influences from Robert Miles to Peter Martin. His “Sad Days” album is a great starting point for his production career, there are many great themes and ideas explored here. The “Album Version” of “Your Sorrow Is Transient” stands out with its deep chugging bass line, smooth hypnotic sounds and gorgeous melodic keys. The trippy sounds of Hadisel’s own deep rework of “Inamorata” also really shines. The haunting synths and ever growing atmosphere puts you in a mesmerizing state and it would also be an ideal warm up record. Electronica sounds come well represented here as well in the form of “Persian Dance At Sunset” and “Melodrama” which close the album out. “Melodrama” in particular has a cool broken beat foundation and an eerie soundtrack vibe which sets the backdrop. It’s the perfect way to close out a moody and emotional album from Hadisal who looks to be just getting started in his production career. We expect much great music in the future from this talented up and comer!